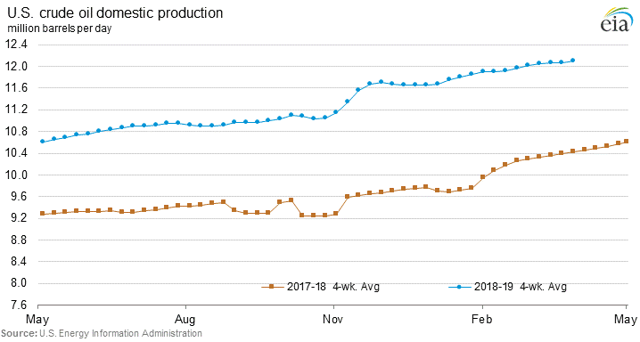 If US Production continues to rise over the coming months, and oil inventories start building again we could see some profit taking in the oil market. If oil rolls over, it wouldn't surprise me that equities are rolling over as well and the culprit will probably be related to oil demand lacking in a weakening global economy. Things can change very quickly in the oil market, both from a fundamental and technical perspective. The oil market has had quite a robust first quarter right along with equities as the Fed has pulled back from rate hikes, taken a more dovish tone, and significant progress has been made on the Trade Deal with China, likely completed during the second quarter. We closed the first quarter just above $60 a barrel in WTI, and we had quite a good start to the second quarter testing $63 a barrel before the EIA weekly Petroleum Inventory report. In looking at the report there are some notable data points, but let's start with a look at the oil inventory numbers. We had a build of 7.2 million barrels, higher than the analysts estimates of a 3 million barrel build. We stand at 450 million barrels in storage (not including SPR) which is about 25 million barrels higher than this time last year. The notable increases occurring at Cushing Oklahoma with 47 million barrels in storage versus 35 million barrels year over year, and the Gulf Coast (PADD 3) with 227 million barrels in storage versus 221 million barrels last year at this time. 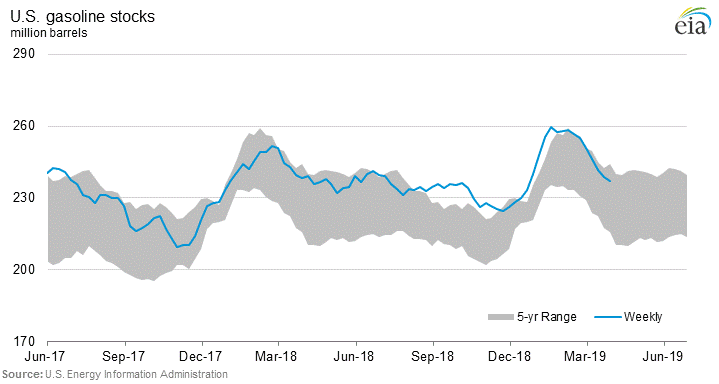 Keep in mind the all-time highs for this metric occurred in March of 2017 at 536 million barrels in storage for total oil inventories outside the Strategic Petroleum Reserves. In looking at the oil production numbers there is more bad news for oil bulls with a new record high in production at 12.2 million barrels per day versus 10.5 million barrels per day a year ago. This despite the fact that oil rig counts have been coming down the last two quarters from over 880 in the fourth quarter to 816 as of last Friday's Baker Hughes Rig report. Oil imports came in at a paltry 6.8 million barrels per day versus 7.9 million barrels per day a year ago. Even looking at the 4-week averages for this metric there is about a one million barrel per day difference between last year. 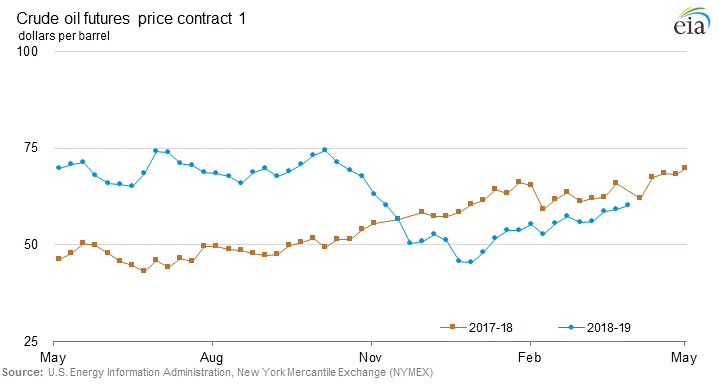 This illustrates the OPEC and Saudi Arabia led strategy of reducing exports to the United States to try and tighten the market, they understand the most transparent market gets them the best bang for their buck in terms of potential impact from the latest oil production cuts agreed upon at the last OPEC meeting. If we look at Refinery Inputs, we ran 15.85 million barrels per day versus 16.9 a year ago. The 4-week averages for this metric are all below year ago levels as well with barely breaking 16 versus 16.7 a year ago. Thus, the reason for the product draws we have been experiencing recently in these weekly inventory reports. The good news is that this has helped reduce some of the excess gasoline inventories where we had another drawdown of almost 2 million barrels for the week. We now stand at 237 million barrels of gasoline in storage versus 239 million barrels a year ago. Remember we stood at 257 million barrels of gasoline in storage about 6 weeks ago, working off a good 20 million barrels of gasoline in storage. Although the East Coast still has more gasoline in storage at 64 million barrels versus 57 million barrels a year ago. This is important because the East Coast gasoline number is closely watched by analysts for any weakness in the market. 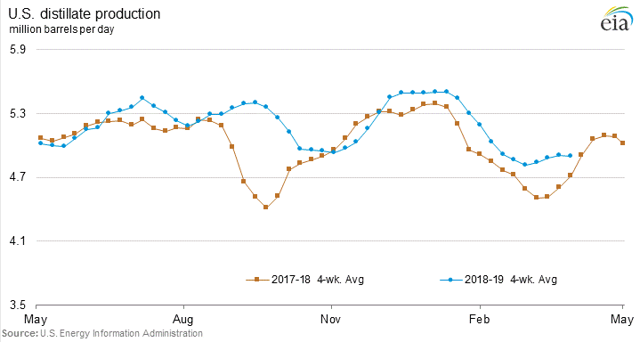 The biggest decrease in gasoline inventories occurred along the Gulf Coast in PADD 3, reducing gasoline inventories by around 9 million barrels in 6 weeks. In checking out the Gasoline Production numbers we produced 9.8 million barrels per day versus 10.1 million barrels a year ago. The 4-week averages are all in the 9.8 range versus 10.2 a year ago, thus it seems like a conscious effort to work off some of these excess gasoline inventories with lower run rates year over year. As Refineries operated at 86.4 percent of their operable capacity which was slightly below the level for the prior week. 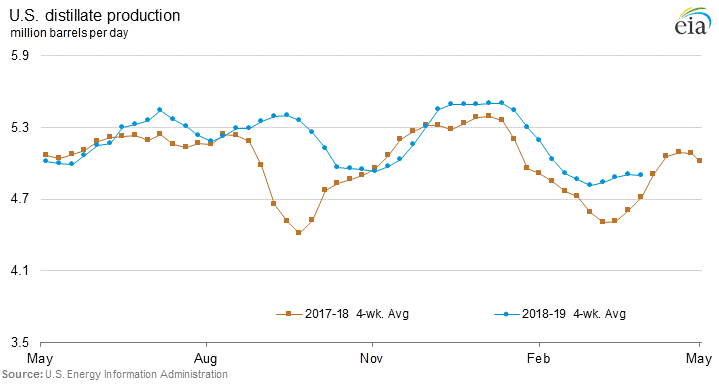 In viewing the Gasoline Demand numbers, we came in at 9.1 million barrels per day for the week versus 9.2 million barrels per day a year ago. The 4-week averages for this metric also came in slightly below the year ago levels. Not that dramatic, especially considering some of the slowdown we are seeing in the economic data for the first quarter in the United States and around the World probably reflecting the damage from the Trade War with China and some of the lagging effects on growth and capital investment projects. However, this metric is something to watch over the next couple of months to check for a potential boost from a successful China Trade Deal being completed and stimulating growth again in the overall global economy. In looking at the Distillates stocks we are down to 128 million barrels in storage versus 130 million barrels of Distillates stocks a year ago. 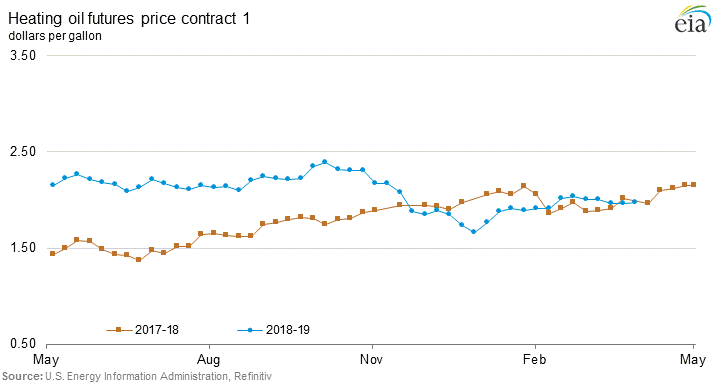 Moreover, we have worked off around 10 million barrels of Distillates stocks over the past 6 weeks with lower refinery run rates. All the regional numbers are reasonably close to year ago numbers so no stand out differences to report here. In reviewing the Distillates Production numbers, we produced 4.9 million barrels per day versus 5 million barrels per day a year ago. 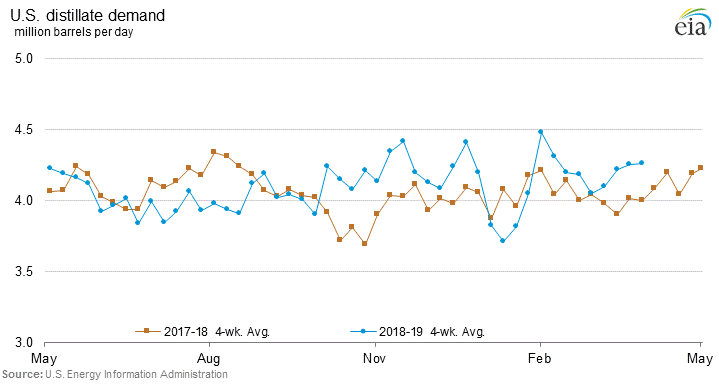 But the 4-week averages for Distillates Production are all rather steady at 4.9 million barrels per day over the last 3 inventory reports and reasonably in line with the data for this metric over the last couple of years. 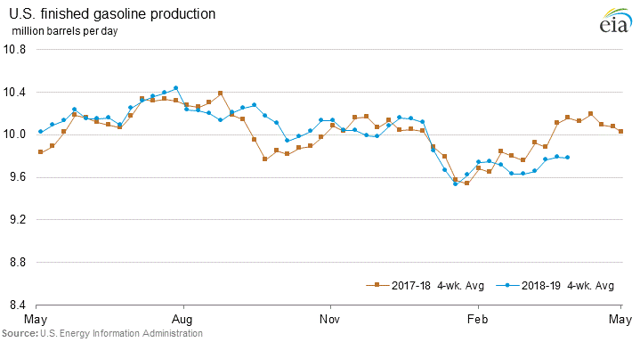 Again, as the world uses around 100 million barrels of oil every day, when things really start slowing down it will be quite apparent in these weekly numbers. As of yet, nothing alarmingly so for this metric. 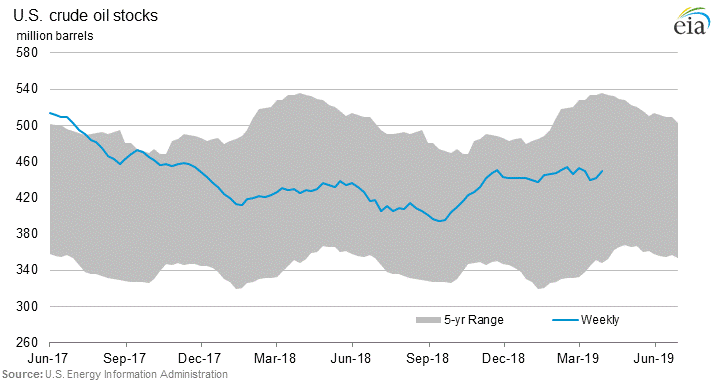 In looking at Distillates Demand we come in at 4.2 million barrels per day versus 3.9 million barrels per day a year ago. 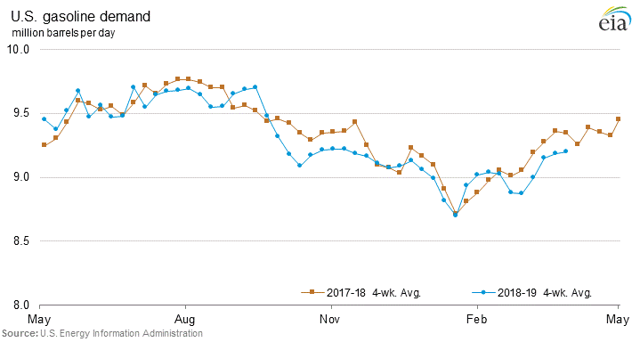 And again the 4-week averages for this metric are coming in around 4.2 to 4.3 million barrels per day in a steady manner slightly above year ago levels. 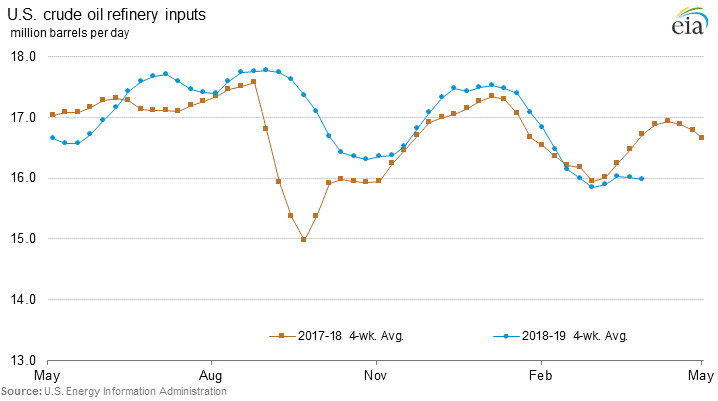 Overall, the big build in oil inventories is something to pay attention to going forward over the next couple of weekly reports. Oil bulls seem to be pricing in the completion of the China Trade Deal, and expecting US Production to either stay at current levels or start coming in a little given the reduction in rig counts. 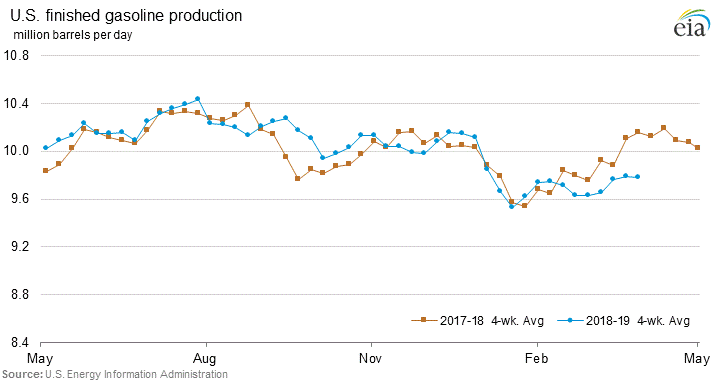 We can see the effects of the OPEC cuts in the form of lower oil imports, but this is being made up from the growth in US Production. 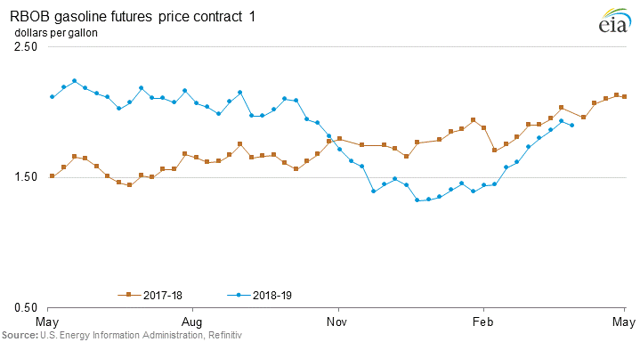 If US Production continues to rise over the coming months, and oil inventories start building again we could see some profit taking in the oil market, especially if the economic numbers continue to disappoint. In that case, we might expect the building of short positions given the runup in oil over the first quarter of this year. Equities and the oil markets have been trading together the last two quarters, thus trading off the global growth or recession theme. If oil rolls over, it wouldn't surprise me that equities are rolling over as well and the culprit will probably be related to oil demand lacking in a weakening global economy. We are still in an uptrend in both oil and equities but we have had quite a run so far, with the question being how long this rally will continue in both the oil market and equities. As for the oil market we are entering the seasonally strong part of the market, the ramp-up into the summer driving season. Refinery run rates should start increasing over the next couple of months with the utilization rate moving up to the 94 percent area during the heart of the summer. Seasonally traders tend to run up oil into the heart of the summer driving season, think July 4th weekend. If the global economy holds up, and US Production stays around these levels, increasing seasonal demand for gasoline could support the oil market into July, taking a run at the technical resistance levels of $70 and then $75 a barrel for WTI. However, we are going to need some follow through with overall oil and product draws, bringing down overall inventory levels. 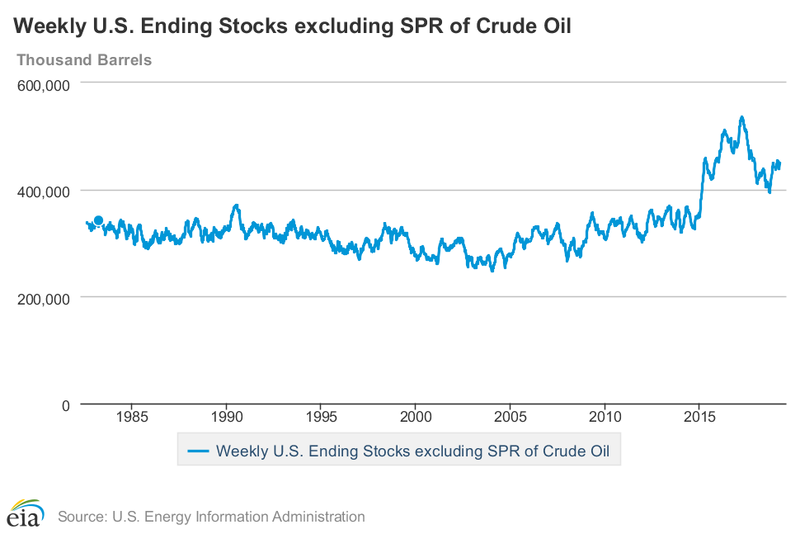 Right now, we are just bringing down products at the expense of crude builds. 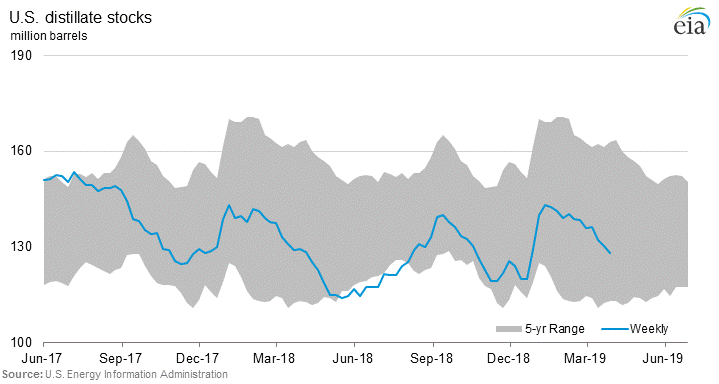 For oil prices to sustain above $65 a barrel we are going to need oil inventories to start moving down towards 400 million barrels in storage in a definite trending manner over the course of the drawing season in the oil market. We moved up nicely for 3 quarters in 2018 reaching a high of $77 a barrel, only to fall off a cliff in the 4th quarter. There are a lot of moving parts in the oil market, and there are sure to be many plot twists yet to come for the remainder of this year, so stay on your toes as a market participant. Things can change very quickly in the oil market, both from a fundamental and technical perspective.